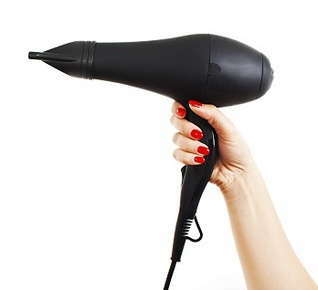 The process seems simple enough – use a blow dryer to take your hair from wet to dry – but these blow drying tips will keep your hair healthier and looking its best. A good blow dry starts with a good wash and conditioning. Dry or damaged hair needs all-over conditioning, while fine hair only needs conditioning on the ends. Blot water out of your clean hair with a towel, or allow to air dry for a while before picking up the blow dryer. Styling products make a big difference. Use your fingers to spread mousse or volumizer through your damp hair, trying to coat every strand. If your hair is thick and curly, a leave-in conditioner can help tame it. Make sure you use the nozzle attachments that come with your blow dryer. Aim the nozzle down the hair shaft to seal your cuticles and keep frizzies at bay. Your fingers are a great tool – starting at the roots, slowly pull your fingers through your hair, holding it out a few inches from your scalp, and drying from the crown down. You need to keep the dryer on the move so you don’t damage any areas of your hair. Hair dries fastest and looks best when you have a plan, and that plan is called sectioning. You can use ponytail holders or clips to divide hair into at least four sections. More hair requires additional sections. Start with the underside of your hair and work toward the top layer. Blow drying time is also styling time. You can straighten your hair by pulling it very taut as you dry it. Drying with a round brush can help the ends flip up or under, depending on the look you’re going for, while a flat brush keeps your ends straight. Or you can use a brush to twirl your hair as you dry, giving it waves. Beware of metal brushes, as they can heat up and burn your hair. Many women say, “It looked so easy in the salon, but I couldn’t figure out how to dry my hair when I got home.” Don’t worry. If you need a blow drying tutorial, make an appointment. We’d be happy to demonstrate these techniques in person. Our goal is to make you look terrific, and to help you feel confident in your hair care routine.